This review was part of Chris Knipp New York Film Festival coverage in October 2008, but is rerun here to acknowledge its gradually widening US release. 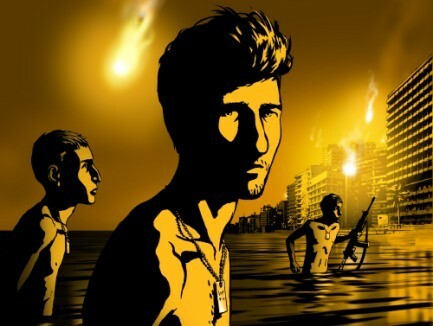 What Ari Folman's calls his "animated documentary" follows a film director who's having trouble remembering a massacre that occurred while he was serving in the Israeli army during the Lebanon War in the early '80s. He tries to fill in the gaps by tracking down his old comrades. Eventually he recreates the Sabra and Shatila massacres as seen from his and his comrades' point of view. The look and the content of this film are harsh and the emotional effect is ultimately powerful, though the subject most of the way though is the numbing down of Israeli veterans who have been involved directly or by proxy with the wholesale killing of Arab civilians. In combat revived memories show the soldiers like zombies, unaware of what they're doing, shooting in all directions without even choosing targets. In contrast to their numbness and indifference, the background music is as loud as an 80's disco; perhaps intentionally: the year of the war is 1982--the height of the disco era. Film music includes a chilling Israeli song that boastfully begins "I bombed Sidon/Beirut today...." For contrast, too often, a Bach keyboard concerto, the same one Glenn Gould used for the background of Slaughterhouse-Five in 1972, is blasted forth. A lady psychiatrist the film director meets with tells him that soldiers' "disassociating" from combat horrors is a common psychological phenomenon. Ironically, the thing that makes one Israeli stop "disassociating" during the invasion of Beirut is entering the hippodrome and observing a massacre of Arabian horses. Mowing down humans didn't affect him. The director also spends time on several visits with a pot-smoking comrade based in Holland who's become rich selling falafel (an Arab food, one might point out) and lives on a posh estate near Amsterdam. He and the director get stoned together and remember. Various other 40-something Israeli army vets appear--animated talking heads whose memories, when they come back, are also in turn animated and shown. One describes abandoning the invasion on his own, going AWOL in effect, and by doing so inadvertently surviving when most of his unit was wiped out by the Lebanese, while he lay hidden for a long time in a zone where all were presumed dead, then swimming in the calm ocean until, exhausted, almost unable to walk, he comes up on the beach and inadvertently rejoins his own regiment. He has previously repressed most of this experience because of thinking himself a coward who had betrayed his comrades. The titular sequence concerns a particularly macho squad leader who in central Beirut under heavy firing, borrows back the automatic weapon he favors and goes into the street, dancing around, firing in all directions while snipers fire from above, yet surviving. At this time Bashir Gemayel, the new Lebanese President, had just been assassinated, which was taken as a signal for the Israelis to step up their attack. At this time they were allied with the Lebanese Christian Phalangist Militia. The Phalangists subsequently were allowed to go into the Sabra and Shatila refugee camps on the pretext that there were several thousand Palestianian "terrorists" still hiding there. They killed at least 800 Palestinian civilians, including women and children. The Israelis knew this, and did nothing. The film reports one soldier calling Ariel Sharon to tell him, and Sharon saying merely thanks for the information, happy new year. This is the climax of the film, the massacre, seen from a safe distance, but with analogies to Nazi murders and the Warsaw ghetto and with a few seconds of live actual video footage of loudly wailing Palestinian women after the massacre going back to witness what has happened and saying over and over to the camera in Arabic (not translated) "Photograph this, bear witness!" One writer (Onion A.V. Club) with some reason links Waltz with Bashir, for its "dreamy, meditative rhythms," to Linklater's Rotoscoped Waking Life--and questions whether it would be of as much interest if it were live-action. In fact the value and point of the animation is that Folman can recreate the recovered memories of the soldiers--just as they remember them. He, that is the director, initially remembers absolutely nothing (But do actual film records exist? Surely they do). Perhaps the film is correct in not making any political point, perhaps not. It seems like raw material, the experiences it refers to still not fully digested and understood, the larger political context left undefined. This is of course a film that would be experienced very differently in various Israeli, Lebanese, or Palestinian settings, and might be wasted on some American audiences. Note the A.V. Club writer's question. But at least what we have here is a strong artifact, the only one in the New York Film Festival, of the torment that is Middle East politics. The film is in Hebrew with English subtitles. Subsequent to its October showing in the NYFF it will be released by Sony Pictures Classics starting December 26, 2008. I discussed the film with Oscar Jubis in March 2009 on Filmleaf.